Somewhere around 1810, a Chimayo friar was performing penances when he saw a light bursting from a hillside. Digging, he found a crucifix, quickly dubbed the miraculous crucifix of Our Lord of Esquipulas. A local priest brought the crucifix to Santa Cruz, but three times it disappeared and was later found back in its hole. By the third time, everyone understood that El Senor de Esquipulas wanted to remain in Chimayo, and so a small chapel was built on the site. Then the miraculous healings began. These grew so numerous that the chapel had to be replaced by the larger, current Chimayo Shrine — an adobe mission — in 1816. 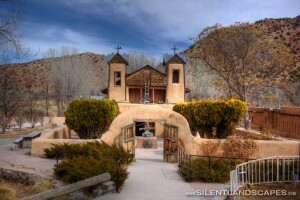 El Santuario de Chimayo is now known (at least locally) as the “Lourdes of America.” The crucifix still resides on the chapel alter, but for some reason its curative powers have been overshadowed by El Posito, the “sacred sand pit” from which it sprang, which gapes unheavenly behind the main altar. Over 300,000 people visit the Santuario every year. The Prayer Room, which is located in the sacristy of the church (next to the pit), is filled with discarded crutches, braces, and scary, handmade shrines that look more voodoo than Catholic. Also on site here is a restaurant, a burrito stand, and gift shop that sells everything from souvenir T-shirts to refrigerator magnets. Tens of thousands make pilgrimages each year to this small adobe church just north of Santa Fe. Built on the site where a mysterious light is said to have come out of the ground on Good Friday night in 1810, the chapel holds a sacred pozito (small well). The dirt from the pozito is believed to have miraculous healing properties. Every year on Good Friday, thousands of people line U.S. 285 for miles en route to this sacred spot. Directions: From Santa Fe, North to Pojoaque, and then Northeast on route 503 through Nambe. Follow signs for 76. The Santuario is located at the Intersection of Hwys. 76 & 520, then south one mile.